Caudalie is beautiful brand, with a collection of products that have beautiful origins. Their story begins in the vineyard of Mathilde Thomas’ family chateau, where a chance meeting with an expert professor in polyphenol research led to an important realisation: the grapes that she was growing for wine were actually incredibly beneficial for skin. And so started a journey that would see Mathilde create a brand that is now synonymous with polyphenol research, with cutting edge products and a spa-like ethos that perfectly marries science with pleasure of use. In short, it’s a brand that’s so worth exploring. 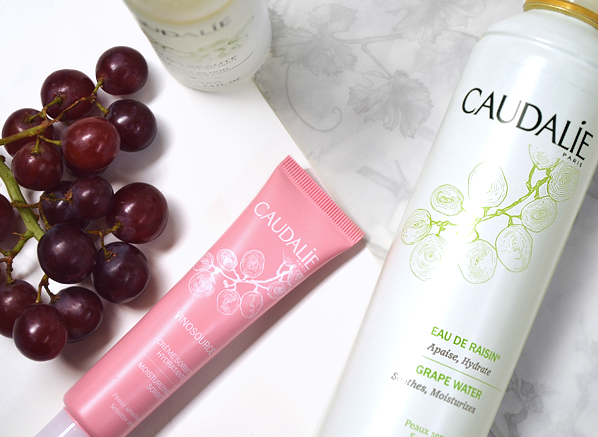 This understated can contains Caudalie’s most valuable asset: 100% organic grape water. It’s the raw ingredient that kickstarted everything when, back in 1993, Mathilde Thomas met with Professor Joseph Vercauteren, who told her the surplus she was throwing away during grape harvest season was actually full of skin-loving grapeseed polyphenols. Fast forward the clock, and today the entire Caudalie range contains some aspect of the vine to make the most of its antioxidant and moisturising properties. The easiest way to incorporate the grape gold of the Grape Water Spray into your routine is with this all-rounder mist, which can be used as a toner and a cooling spray to keep skin feeling fresh all day (keep it in the fridge for even more refreshment). It gives an instant boost of hydration whenever it’s needed thanks to polysaccharides and mineral salts – even the most sensitive skin types will love this. My favourite Caudalie product is this evocatively-named spritz, the Beauty Elixir, otherwise known as the darling of beauty editors, celebrities and makeup artists alike. It just works, and there’s nothing else quite like it! Where the Grape Water Spray is all about soothing, the Beauty Elixir is all about zingy energy and a real boost of radiance, with a blend of bitter orange flower water, rosemary leaf oil, peppermint oil, balm mint leaf oil and damask rose oil. This blend of precious oils and flower water works to tighten pores and intensely freshen up the complexion, ensuring skin looks supremely glowy. You can use this to wake up your skin at any time of day, but it’s particularly beloved as a make-up setter. Shake the bottle to blend the water and oil together, then spritz all over the face and bask in the wonderful scent and feel. One of the many things Caudalie does so well is recognising the importance of texture in their products. The skincare classic Caudalie Vinosource Moisturising Sorbet is a great example of this. Originally created for sensitive skin types, but pretty fabulous for everyone who craves a dose of lightweight hydration, the sorbet-like moisturiser breaks into water on contact with the skin for a wonderfully refreshing, cooling feel. The 98% natural formula is crafted from organic grape water, camomile, antioxidant grape polyphenols and a great big whack of plant glycerine for durable moisturising that doesn’t overload skin. Skin feels supple and healthy – and it looks it, too. Need a personalised Caudalie recommendation? Ask away in the comments below, or tweet me @EscentualEmma! This entry was posted on Friday, June 24th, 2016 at 9:00 am and is filed under Skincare, Tried & Tested. You can follow any responses to this entry through the RSS 2.0 feed. You can skip to the end and leave a response. Pinging is currently not allowed. I love Caudalie’s Beauty Elixir! I have their Grape Water on my list to try next from B-Glowing, can’t wait!